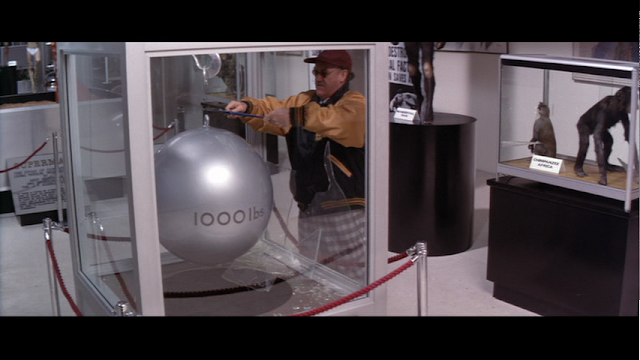 After 1978's Superman was a box office smash, Superman II and III garnered diminishing but still profitable returns. 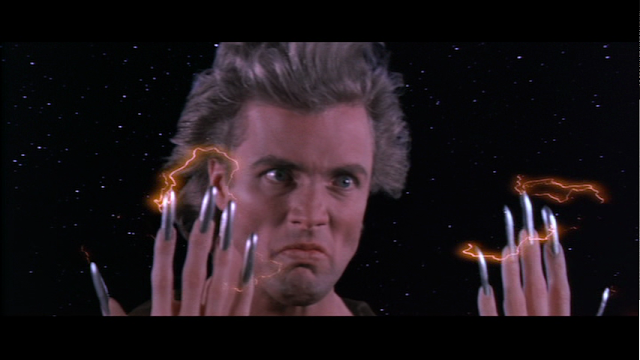 It wasn't until 1987's Superman IV that the franchise completely imploded, both in financial success and thematic coherence. The franchise was sold to Menahim Golan and Yoram "Golden" Globus, the Israeli B-Movie producers responsible for YSM favorites The Apple and Over the Top. 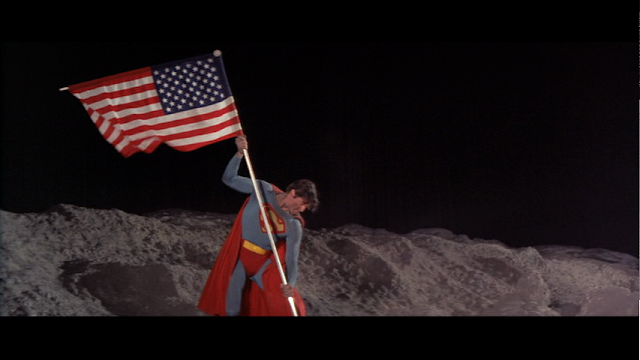 Rather than an appropriately paced and grandiose film, Superman IV features only remnants and signifiers of this once great spectacle. 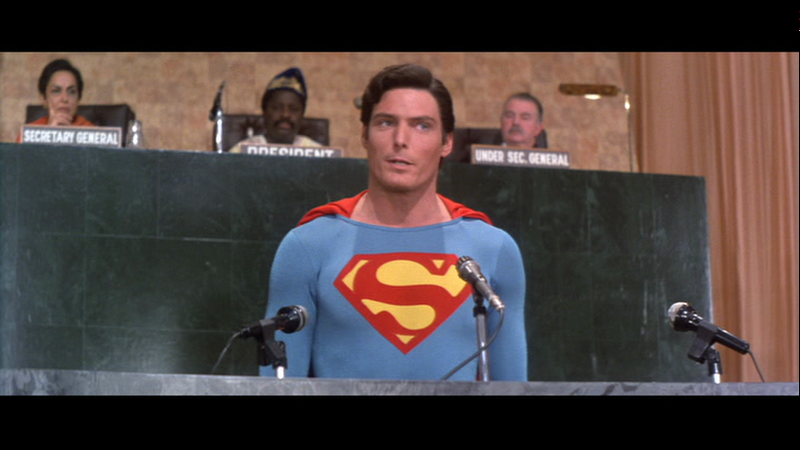 Chopped down from 134 minutes to an incoherent 89, the film speeds through the plot faster than a locomotive, makes frequent thematic and logical leaps over tall buildings in a single bound, and flies over the audience's heads with Superman preachily declaring world peace in front of the UN. Superman urges the world's children to brush twice a day. 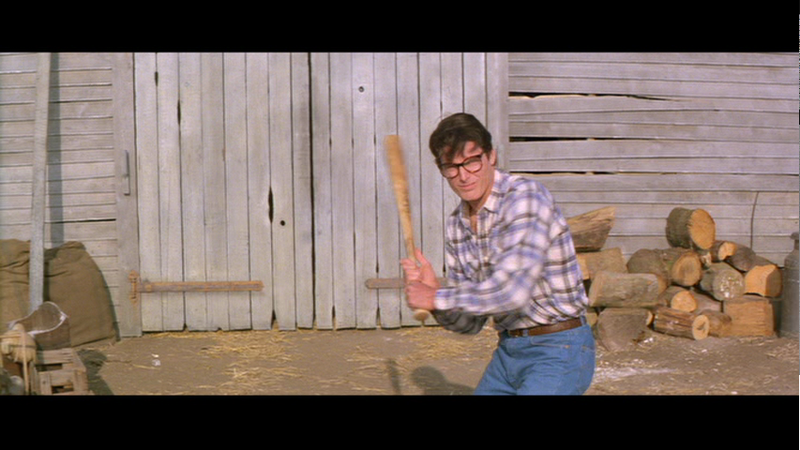 After a brief stint in space saving some Cosmonauts and speaking Russian, Superman (Christopher Reeve) visits the old farm in Smallville. Clark refuses to sell the farm to a commercial developer and retrieves a green crystal which holds the the echoey floating heads of his Kryptonian ancestors. "Right across the plate, Scout." Meanwhile, Lex Luthor (Gene Hackman) smashes rocks in a prison chain gang. He is rescued by his moronic but also scientifically gifted nephew Lenny (played by Jon Cryer, showing off those acting chops that won him the Emmy), who traps the guards in his remote control hot rod and drives it off a cliff. Cryer maintains a surfer voice but is dressed like a post-punk mohawked 1950s throwback, which straddles the line between deliberately stupid and actually stupid. Superman receives a letter from an adorable little boy asking him to rid the world of nuclear weapons. Why he needed a 4th grader to think of this idea is unclear. Heeeyy. I don't remember saying that. After a belittling speech at the UN, Superman gets to work rounding up all the nukes and placing them in a giant net which he presumably made himself. 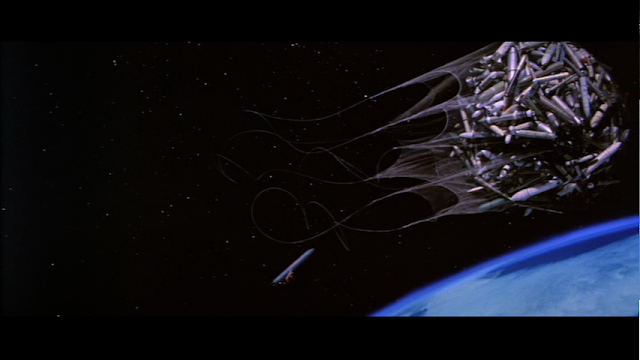 All the world's nuclear weapons are concentrated in a flimsy space net. Now we're safe. Luthor celebrates his newfound freedom by doing what he does best: implementing a ridiculously elaborate plan to destroy Superman for no reason. He crashes the Superman exhibit at the Metropolis museum and steals his super mega strong strand of hair. Luthor owns the world's only pair of Kryptonite bolt cutters. Luthor doesn't want the hair for its inconsistent strength properties, but so he can clone Superman! Through his unexplained military resources and a nuclear missile launched at the sun, Luthor creates Nuclear Man (Mark Pillow), a creature of limitless power, except for when he isn't directly in the sun, at which point he becomes completely immobile. It's nice when a film introduces a character and explains his inevitable downfall in the exact same scene. Meanwhile, Superman/Clark Kent maintains a poorly-executed love square with Lois and his new hot boss Lacy (Mariel Hemingway). Lacy loves Clark while Lois loves Superman, and he agrees to an uncomfortable Three's Company -like double date that he could have easily avoided by saying he was busy that night. Instead he switches between Clark and Superman. At one point Clark jumps into the back of a limo and immediately emerges from the other side as Superman, as if anyone watching for more than three seconds would never discover the ruse. Nuclear Man shows up and scratches Superman with his super-manly claws, and the Man of Steel is forced to use the green crystal to regenerate. Superman traps Nuclear Man in an elevator car and takes him up to the moon to duke it out, and he does away with his foe and the remainder of the run time with ruthless efficiency. While Superman I-III are far from perfect, Superman IV did an amazing job of pinpointing its flaws and minimizing its strengths in the shortest duration imaginable. No plot element is given enough time to develop, and the brevity only helps in portraying the hero as an aloof and unsympathetic goober. While a filmmaker could portray Superman burning Lois's dinner and tossing her like a rag doll at 30,000 feet as charming, in Superman IV it's callous and bizarre. And while Superman's quest for peace is noble, in this universe a majority of threats to the earth are from people trying to destroy Superman, so he can hardly call the human race destructive compared to the amount of mayhem he's vicariously caused. 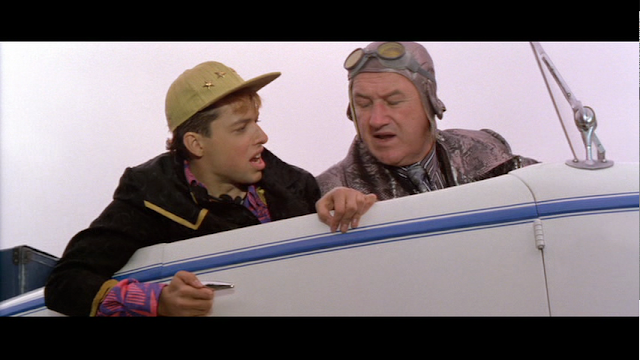 Furthermore, while the first two Superman films create a unique world with its own distinctive look and feel, Superman IV does away with any care or meticulousness its predecessors. Large chunks of the script are hacked away to the point of incoherence. Nuclear Man becomes infatuated with Lacy for no reason and carries her off to space, apparently bringing a pocket of oxygen substantial enough for her to survive the ordeal. Metropolis is no longer a thin representation of New York, but New York itself. At one point Nuclear Man picks up the Statue of Liberty and carries it around. And the film invents new absurd powers for Superman, like the ability to magically reconstruct the Great Wall of China, and giving Lois an amnesia-causing brain tumor that makes her forget he's Superman every five seconds. 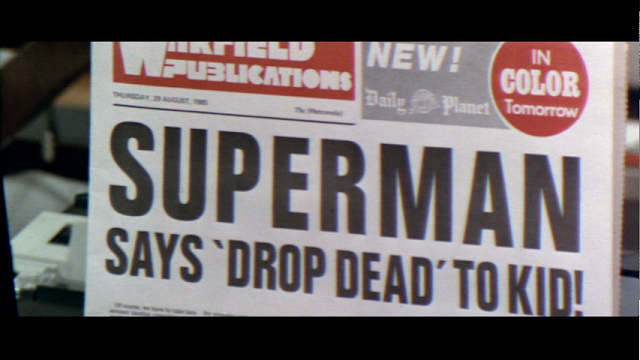 Though Superman IV is unrepentantly awful, its brevity may be its greatest strength. It at least respects its audience enough to not drag it out, unlike Singer's self-fellating 154 minute love letter to the franchise. It enjoys itself enough to ignore the history or nostalgia of the character. Superman IV is bad, but with a slightly bigger budget and fifteen more minutes, it could have been good. Forty cakes (that's as many as four tens). Luthor: Lenny, I've always considered you the Dutch Elm disease in my family tree. Lacy: All men like me. I'm very very rich. Lacy: You ever thought of wearing contacts? Clark: Uhhh they erm... make my eyes itch. Lacy: How can one man be so square and so delicious? Luthor: Goodnight sweet prince. Parting is... inevitable. Superman repairs the Great Wall using his... powers. If you look close during the Lunar bit, you can see that the background is BLACK CURTAINS, and not some painted backdrop. Also you forgot the bit at the end where Superman throws the bad guy into a nuclear power plant, and all the needles shoot up sky high....and this was a year after Chernobyl, which also had needles going sky high. And explosions. "Golan-Globus: Bad taste? What's that?"